Received hat, he loves it! Love the color, worth the wait. I received the hats today and they are perfect - just what I wanted. Somehow that color is impossible to find around here �- I also tried in different hat shops that had the style but not that color. I hadn't heard anything so thought I'd check.� No problem on the delay. � Thanks for the information. Hi, I just wanted to share a little story. postmaster to wear a non-regulation hat because I wanted something with a wider brim. a mail carrier with an AWESOME hat before!" The vest is here already...and it is absolutely great! I also see that is was priority shipped, insured, as well as free shipping. I received my hat today and it fits my little head perfectly, thank you so much for everything. It was well worth the wait. I really wanted to comment on your customer service, it was simply perfect. Anytime I had a concern I was emailed back promptly. So for that, I thank you, I'll be fly fishing the rivers proudly with my Jacaru hat on. Got my vest in the mail today.� It is fantastic. Thanks for all your help Capt. John. Got the hat, fits perfect !!! I get lots of complements on this hat and also the� 5H23 New Mainlander that I purchased. Thank You so much for keeping in touch regarding my merchandise that I am so looking forward to receive. Thanks for exchanging the vest. Great product, well made, fits great!! My son loves his vest. I received the vest today! Thank you so much!!! I am wondering if you offer gift cards? I am needing to get one for my brother in law. If so, could you please let me know? Thank you so much for your consideration and fast service. Will be ordering more goods! Just wanted to let you know I received my Kelly vest today. Fit and function is great, with super fast shipping. Love the hat, love the hat, love the hat...did I mention I love the hat. The size L coat arrived and it's a good fit and a great coat. (I had lost weight during the summer). � Thank you for your kind attention these months. I'm a new and distant customer from North Georgia. Loved the hat I purchased from you guys! It fits great!!! I was looking at another hat you sale, the Wallaroo Suede Outback Jacaru, sand color. I need a size 57, but was curious about the measurements. What is the crown and brim size in inches? Thank you so much for your update on my purchase. I did not have a tracking number , but now I will be able to follow it's progress. I look forward to doing business with BlueWater Group again in the near future. Recd. the hat and very much appreciate the piece. it is a wonderful hat, much better than I expected it to be. With this heat, I don't think I'll be wearing it for awhile. I just wanted to make sure the order didn't accidentally get lost. My husband received the hat on his birthday, he loves it, thank you for all of your help and for ensuring it arrived on his birthday. Just wanted to let you know the vest arrived here today. I received my new jacket today...awesome! Super high quality and an amazing price. I had been contemplating buying a Barbour but just couldn't justify the cost. While I've never seen a Barbour, I can't imagine the quality could be any better. Can't wait to go for a ride! Your immediate response is appreciated. This level of customer service is refreshing. We have ordered the Utility Bag for my wife and if it's as good as we think it will be, there are several other items we will purchase as well. thanks & the hat fits/looks great. Thanks for getting it to me quickly. GREAT customer service! I will check out the rest of your sight and see what else I need. Thanx again for changing the xs to XL! Any other recommendations on conceal carry gear? The parcel arrived yesterday morning�all fine. Received my jacket and could not be more pleased with the quality and speedy shipping. Today we received the jacket, Size approached, great jacket and super fast shipping! just received my jacket so much worth the wait thank you very much! Got my hat, I love it! Perfect for this amazingly cold weather! The bags showed up today. Well worth the wait, thanks. Found the package on my porch last night. Thanks for the great service and response. Ok I just ordered a jacket for me too! I'm thrilled my son found your site! Package was received.� Very impressed with both items.� Well worth the wait. I love the look of that stuff. I could see buying one every month or so and collecting it all. Great customer service�.much appreciated ! Thanks for going above and beyond to get it there. I'll be sure to let everyone know where I got this beauty. Thanks for the wonderful service all around. We'll probably do business again. My sister in law got the vest already. I want to thank you, and I am hoping to do business with you again. Just got my vest, LOVE IT. My dad would also love it, I'll give him a call tonight and recommend it, thanks! My Kakadu 4J02 Workhorse jacket came in.� Thanks for the quick ship.� The coat is great.� I'll recommend friends to you guys.� Great Service, Great Customer Support, Amazing Prices. Thats fantastic service,you can bet your bottom dollar I will be getting some of your shirts this spring. Thank you so much for your great service...... just paid the bill and am excited to receive the goods in the mail.� I still need another black hat.... so I will get back to you soon. This is now my fourth Akubra and they are incredible hats! I already had a black Squatter that I bought from a fellow collector. It was virtually unworn when I got it and it is a great hat, but the brim to crown ratio on this gray one is even better. I am a real fan of '40s movies, fashions, etc. and this hat looks like it just stepped out of a film noir set. The Bushman is still the greatest, but this Squatter takes a narrow second. The Bushman got here and all I can say is, I wish they came in other colors, because I'd order one. Thanks for your help and service. This is a terrific hat. I received the shipment today. Both me and my friends are impressed with the coat, and it seems like it will suit my needs perfectly. Received the jacket today and what a great piece of kit it is . Thanks for all your attention . Got home from work today and your brown box was waiting for me :) The hat is GREAT !! Love the color! As usual, Akubra's fine, fine quality. I would just like to say I am over the moon with them and very much worth the wait , my good word will be going round the uk about your site !!! the quality is amazing ! and also your customer care contact has been second to none which is a pleasure these days . MANY MANY THANKS !. I look forward to purchases in the future with your company,And as im a hairdresser in my own business word will get round how great your site is . I received the backpack today and it is perfect- my daughter loves it! Thanks and I will probably be ordering another bag for me. Never mind my previous email, the jacket just arrived. It was worth the wait. I am really enjoying my new Kakadu jacket. I really like the look and function. I received my Kakadu backpack today and am very happy with it and the service you provided. Capt. John.....all I can say is one thing, YOU ROCK !!! Thank you for your prompt attention. I have enjoyed working with you, as you have handled this sale very professionally. The company, if not owned by you, has a great asset to which they should be honored to have you among their team. I will ship the box back to the address you have provided by Monday, next week. Ohio has been hit heavily with snow and prevents much travel. Thank you, once again, for all you have done. I will certainly do business with you and this company in the future and will not hesitate to refer others to you as well. We received the jacket and my husband is very happy with it. I really appreciate it and love the service. I will definitely be ordering more from you. Thank you very much for the great customer service. It's rare these days and it's the reason I didn't cancel my order. Got my bag today - absolutely love it. LOVE IT ! ! ! ! thank you. CuChullaine and Basha O'Reilly have each bought the appropriately named "Long Rider" coat by Kakadu. As these pictures of Basha show, it can be worn long or short, or transformed into chaps. While we haven't tested this coat in the field, we believe it has great potential for Long Riders wherever they are. We bought them from Kakadutrader.com This '3 in 1' multi functional waterproof oilskin coat has cowhide storm collar & rein guards, deep double stacked patch pockets, removable cape, storm collar tab, snap closure covered by large snap down storm placket, drawcord waist, adjustable cuffs. 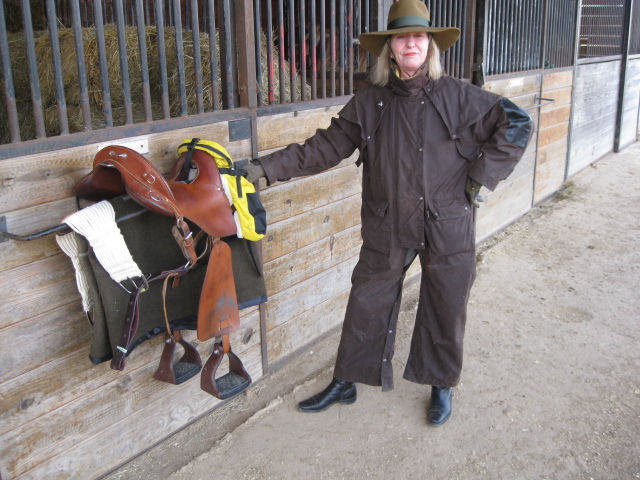 A series of strong snaps transforms the full-length coat into a 3/4 length jacket or chaps. Equally importantly, unlike tight raincoats, this one is loose enough to allow you to move easily in the saddle, and long enough to prevent rain getting into your boots! These gloves are great! I have never before found warm and waterproof gloves for riding in the pouring rain. 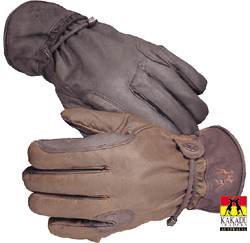 But you do need to have long sleeves on your coat or jacket, otherwise after several hours the rain will seep under the cuffs of these gloves. Ok so I wanted to thank you guys for being so awesome helping me with my order. It came today and the Nelson jacket looks and feels great. You guys' customer service is top notch and I will definitely forward anybody I can towards your business. I just received the Gunner's Coat, and it is excellent. I am very happy with it, the amount of detail and quality is very pleasing. And it arrived in record time - very fast delivery. I'll be sure to recommend your company every chance I get. I first saw this coat on another website, or a coat very much like it, for $160. I'm pretty good on the web and was able to find your website in a matter of minutes, and your price was much better. Thanks for your help, and I'll be ordering again from you very soon. Thanks for taking the extra time and effort. It is much appreciated, and I hope you reap the rewards of your good business practices. The coat just arrived - this is an incredible coat! There are 'way more design features than the other one, & it looks great as well. Thank you! If you have mailing lists for catalogues, please add my name; also, do you have a couple business cards you could mail to me? Just wanted to let you know that I received my jacket today. It is exactly what I wanted. I wanted to take te time to say thank you, and that I look forward to doing more business with you in the future. I really appreciate you changing the order for me, especially since it was due to my own mistake. I also appreciate your prompt reply to my inquiry regarding the correction, and the estimated time of its arrival. Again, Thank you so very much. Its great to know that top notch customer service is not dead, or farmed out to a foriegn country. Also received the Double Bay Jacket yesterday and am very pleased. I have now received the package, and everything is just fine. Thank you for working through the issues at hand, the Rhino bag is exactly what I thought. I will certainly order more products from you! Received hat , what a great hat !! The fit is perfect see you in the future.